A while back, I went on a hunt for the original cookbook that the Busy Day Cake appeared in, and when I found it, I purchased several vintage recipe booklets on ebay. I was astonished to discover one called Kate Smith’s Favorite Recipes , which I assume was also produced by the Swansdown Flour Company, as Ms. Smith is pictured gleefully holding up a box of said flour. WARNING: THEY ARE NOT DIETETIC; so have NO expectations of figure friendly recipes. If you are looking for a Kate Smith cookbook on Amazon, chances are good that you already know who she is. If you don’t know, check out this video of her singing God Bless America. Great voice, right? But not a figure that suggests you might want her salad recipes. Anyway, I bought myself a copy of the Favorite Recipes booklet, because I was curious what sort of treats I might find inside. One day, when I wanted a treat but not a trip to the store, I dove into her book and found a recipe for coconut squares, which I made because I happened to have all the needed ingredients on hand. After mixing it all up, the batter seemed like it needed something, so I chopped up and tossed in two squares of a Ghirardelli semisweet chocolate bar I had. 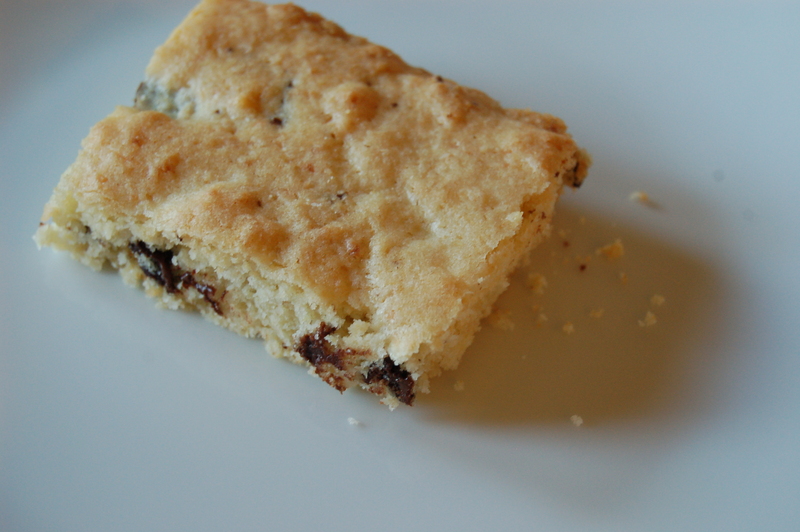 The squares are moist and soft, with lots of coconut flavor and texture contrasting with smooth bits of chocolate. I think the contrasting crunch of macadamia nuts would also be a nice addition; or if you added chocolate and almonds, you’d have an almond joy square. I had to make two batches, in the end – the first batch mysteriously disappeared and I later learned were consumed quickly by the neighbor children. The Child then requested I make more, because she was going to her friend’s house and wanted to bring some there, too. They whip up in quickly – in about ten minutes, and disappear quickly as well. The speed, as well as all the possibilities for variations on the theme, mean I’m happy to add this recipe to my permanent collection. Sift flour and baking powder together; set aside. Cream butter thoroughly; add sugar gradually, and cream together until light and fluffy. Add egg and beat well. Add vanilla and coconut. Add flour gradually, beating well after each addition. Mix in chocolate chunks (or whatever you decide to add, if anything). Spread into a buttered 13x9 baking dish, and bake 20 minutes in a 350 degree oven. Cool and cut into squares in pan. The original recipe says it makes 2 dozen, presumably itty-bitty, squares. I cut a dozen squares, in a size that struck me as reasonable. My point? Your mileage may vary considerably.